This notebook is quite usable with eCS 2.0 beta 3. 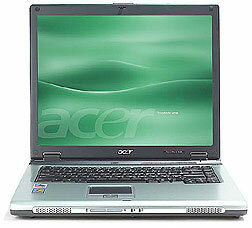 The Acer Aspire 5550 is one of those cheap 14" 16/10 Notebooks floating around at your local discounter (namely Saturn/Germany). They sell for about 700 Euros. Windows users don't like that thingy because it comes preloaded with so much software that you are best off wiping the disk and starting from scratch. Actually half of the 60GB disk is filled with crap. Additionally it has major timing issues when used for playing DirectX-Games. Many of those notebooks are returned to the stores by frustrated Windows users so you might happen to get a barely used device for about 500 Euros. However, this cannot scare eCS users: It performs fine playing movies and any other stuff i could throw at it. My specimen (the low-end configuration) features an Intel Cenrino processor, Intel 945GM graphics adapter (Supported by SNAP) as well as Intel High Definition Audio (ICH7, supported by Uniaud). The WiFi adapter was not tested but was detected ok, wired net is ok (Realtek). ACPI loads and appears to work. Note that the hardware varies quite a lot so if you play with the thought of buying one: Read the description first.